Your support helps The Paley Center for Media fulfill its mission to maintain and expand its unsurpassed public collection of over 160,000 television and radio programs, and to interpret the cultural, creative, and social significance of media in ways that both entertain and inform. The Paley Center for Media is a 501(c)(3) nonprofit organization. Announcing that The Paley Center for Media is now a charity listed on AmazonSmile! AmazonSmile enables you and your family and friends to support the Paley Center every time you shop, at no cost to you. 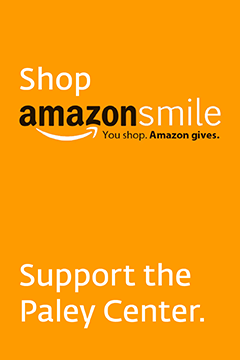 When you shop at smile.amazon.com, Amazon will donate a portion of the purchase price to the Paley Center. Tens of millions of products on AmazonSmile are eligible for donations. You will see eligible products marked "Eligible for AmazonSmile donation" on their product detail pages. Why choose the Paley Center? Your support of The Paley Center for Media through Amazon Smile makes so much good work possible, from the preservation and digitization of our incomparable archive of more than 160,000 television and radio programs—a unique audio-visual record of America’s historical and cultural heritage—to classes and other education programs for K-12 students and teachers that enhance media literacy and social studies programs, and year-round public programs that explore and celebrate the creativity, innovations, and leaders who are shaping media. Gifts of $250 and more can be made as a special tribute to or in memory of a family member, friend, or colleague. These gifts will be acknowledged to the recipient of the tribute or to the family of the memorial honoree and be listed on the Paley Center’s website and on the Tributes and Memorials wall in the Paley Center’s libraries in New York and Los Angeles. Please use the Comments field on the online donation form to specify the text of your memorial or tribute, or call Patrick Tekula at 212.621.6653. With a gift of $500, you can “adopt” a half-hour television or radio program with personal significance. A gift of $1,000 enables you to “adopt” an hour-long program. Your funds will help the Paley Center digitize and catalog its nearly 150,000 program collection—the foremost public archive of its kind. Each time your “adopted” program is viewed by a guest in the Paley Center’s libraries in New York and Los Angeles, your name will be listed as a contributor. A full catalog of our collection is available in the Paley Center libraries in New York and Los Angeles, and you can search the holdings in our collection online. Please use the Comments field on the online donation form to specify the name of the program(s) you want to adopt, or call Patrick Tekula at 212.621.6653 with your program selection. With a gift of $5,000, you can dedicate a theater seat in the 198-seat Bennack Theater in New York or the 150-seat Mitchell Theater in Los Angeles in memory of a loved one or to pay tribute to a friend, family member, or colleague. A gift of $2,500 will dedicate a theater seat in the 84-seat Goodson Theater in New York. A plaque with up to two lines will be attached to the back of the seat. These dedications are for a period of ten years, and are renewable. Please use the Comments field on the online donation form to specify the text for the plaque, or call Patrick Tekula at 212.621.6653. Please consider including the Paley Center in your estate plans. These planned gifts are crucial for our future as we strive to preserve modern history captured by media for future generations of media enthusiasts, educators, and students. These gifts don’t have to be complicated, and can benefit you and your family as well. A bequest can be just a simple designation in your will and will not affect your cash flow during your lifetime. Other types of gifts can increase your income, provide a cash stream, or even give you a tax deduction for items that you can no longer use or maintain. A planned gift can also provide benefits to your family and loved ones. Call Susan Madden at 212.621.6752 if you would like more information about any of these gifts. You can click through to a secured server for direct payment for the above giving options. If you prefer to make a gift by phone, call 212.621.6782 or 310.786.1066. The Paley Center for Media accepts American Express, Visa, or MasterCard. You will need to have the following information ready: your card number, expiration date, the name as it appears on credit card, and your email address. If your employer’s personnel department administers a matching gift program, please obtain a matching gift form and forward it to the Paley Center.